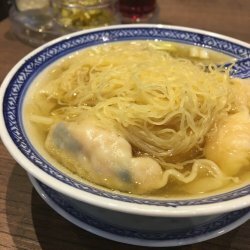 Referred to by many as the Hong Kong best wonton noodle, 麥奀雲吞面世家 has opened its doors in Singapore. I didn't have the chance to visit their first shop at Centrepoint, so I was thrilled when I saw their Westgate outlet. Long queues was seen forming since their opening. I passed by at a hour where there wasn't any queue so here is the chance for me to check this place out. Service was good and orders were served rather fast. Hence, it would not be a long wait for seats even if there is a queue. 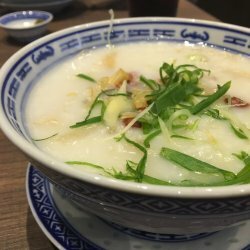 Hong Kong's well known wonton noodles 細蓉 that are served in small portions. Noodles were springy and the texture was just right, not too soft. 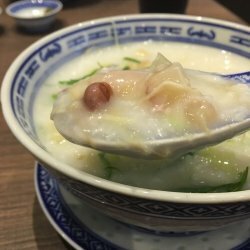 The skin of the dumplings were thin and prawns were fresh. Just that, given the size of the serving, it might not be able to fill the stomach of some. 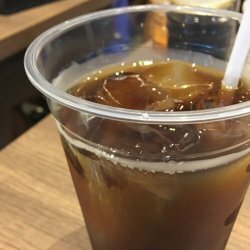 Freshly made luo han guo is refreshing and soothing to the throat. A good choice especially on hazy days. Smooth textured congee was tasty even on its own. It is not necessary for extra seasoning unless you prefer stronger flavour. Cuttlefish was soft and chewy with fresh fish slices. However, the fish slices were too thinly sliced that you could hardly notice.